Explanation: Young suns still lie within dusty NGC 7129, some 3,000 light-years away toward the royal constellation Cepheus. While these stars are at a relatively tender age, only a few million years old, it is likely that our own Sun formed in a similar stellar nursery some five billion years ago. Most noticeable in the sharp image are the lovely bluish dust clouds that reflect the youthful starlight. But the compact, deep red crescent shapes are also markers of energetic, young stellar objects. Known as Herbig-Haro objects, their shape and colour is characteristic of glowing hydrogen gas shocked by jets streaming away from newborn stars. Paler, extended filaments of reddish emission mingling with the bluish clouds are caused by dust grains effectively converting the invisible ultraviolet starlight to visible red light through photoluminesence. Ultimately the natal gas and dust in the region will be dispersed, the stars drifting apart as the loose cluster orbits the centre of the Galaxy. The processing of this remarkable composite image has revealed the faint red strands of emission at the upper right. They are recently recognized as a likely supernova remnant and are currently being analyzed by Bo Reipurth (Univ. Hawaii) who obtained the image data at the Subaru telescope. 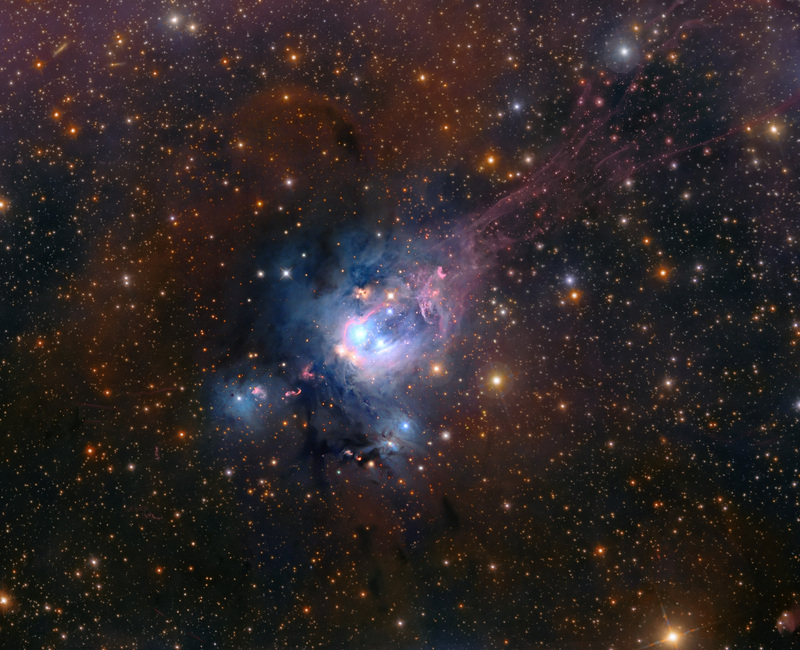 At the estimated distance of NGC 7129, this telescopic view spans over 40 light-years.